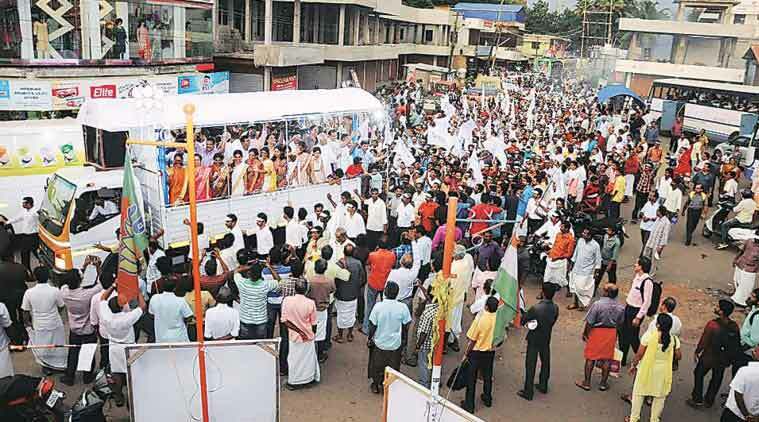 A garment firm’s social responsibility wing has scored a first by winning a majority in Kerala’s Kizhakkambalam village panchayat. Choorakkodu plateau in the village of Kizhakkambalam, where the Kitex group employs 7,000 workers at its garment processing unit, bears not a sign of the trade union activity that is a feature of so many workplaces in Kerala. There are no union flags here, no notices on the walls against the management, no union office boards in front of any of the buildings. Over the years, the state’s largest private sector employer — it has a workforce of 15,500 — has managed to keep away the unions that have been flexing their muscle elsewhere in the state. On November 7, Kitex scored another first. 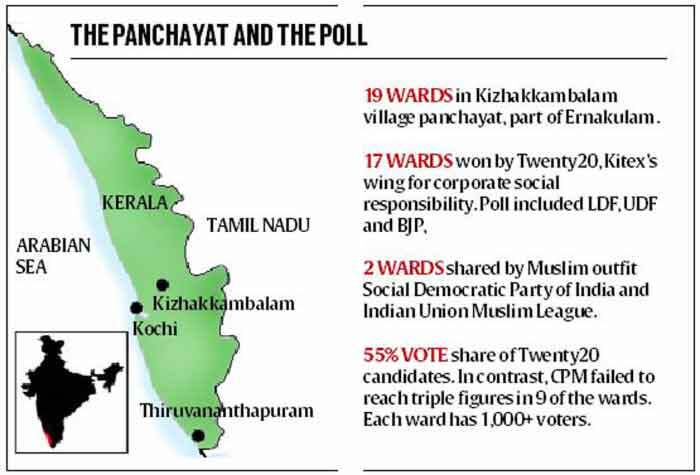 Candidates of its corporate social responsibility wing, Twenty20, won 17 of 19 wards in Kizhakkambalam village panchayat of Ernakulam, where all its units are based. It was unprecedented in Kerala for a corporate house to have contested local body elections, let alone win the mandate to rule the panchayat, which has the powers to regulate the functioning of the same house. A decade ago, for instance, Coke had to shut a bottling plant on a village panchayat’s order. Kitex registered Twenty20 under the Charitable Societies Act in 2013. It was the result of a longstanding battle with the Congress-ruled village panchayat. In June 2012, the panchayat had refused to renew the unit’s working licence on the ground that it was contaminating water bodies with the effluent from its dyeing and bleaching units. A local action council had filed a petition with the State Pollution Control Board which, however, reported to the Kerala High Court that samples from the sewage treatment plant were found conforming to norms. The high court had also appointed a joint inspection committee, including government officials, experts and local Congress leaders. The committee too found the allegation baseless. The court asked the panchayat to renew the licence, which did not do so. The company again moved the court, which served an ultimatum to the panchayat to renew the licence within 48 hours. This licence expired last June, and Kitex has been running on a deemed licence since. The action council has moved another petition with the National Green Tribunal in Chennai; this is pending. A month later, Twenty20 was formed in a large convention at Kizhakkambalam with Sabu Jacob as president and his brother Boban Jacob, MD of sister concerns Anna Aluminum and Saras Spices, as chairman. Kitex’s social service wing has committees at various levels with 4,800 persons. It held a household survey and issued 7,620 cards of four kinds to the panchayat’s 8,600 families, based on their socio-economic profile. The company also routed money to local hands as an aid for weddings, surgeries and snacks for patients at a primary health centre, provided free ambulances, and took farmers to abandoned paddy fields. It also launched a popular, five-day evening market where Twenty20 cardholders could buy commodities at half the market rate. In the last two-and-a-half years, the Anna-Kitex Group says it has spent Rs 32 crore on development and charitable activities — the mandatory annual CSR spending is Rs 1.60 crore. Part of the rest was financed by two other institutions. Initially, all political parties except the Congress backed these initiatives. When the company ventured into polls, it put off many political leaders but a few of them, company sources said, stayed with them. It enjoys the support of a large section of Christians, the backward Hindu organisation SNDP Yogam and many in the SC communities. Local CPM leader and former panchayat president Anil Kumar said the government machinery has limitations in releasing funds and executing a project. On the other hand, a company can conceive schemes and execute them professionally, he said. Rajeeve, a former Rajya Sabha MP, said that there should be legal clause in the Companies (Corporate Social Responsibility Policy) Rules, 2014, that would prevent a company from using the CSR fund for political purposes. Many local people, particularly politicians, alleged the company rolled out the freebies to offset the charges against its bleaching and dyeing unit. Jacob countered that the group’s treatment plants are of international standard and its clients include giants such as Walmart, who would never compromise on quality (see box). The agitation has two other angles. Jacob’s cousin M P Rajan is a local Congress leader, a former president of the village body, and Jacob said a family rivalry has been running for several years between them. The other factor is a decision to start an auto service with a fleet of 40, which antagonised some local auto drivers, who used to charge exorbitant rates. Sources said a section of auto drivers affiliated to various trade unions teamed up with right-wing Muslim organisation Social Democratic Party of India. Incidentally, SDPI candidate Abdul Rahman won one of the wards; he is also the leader of the action council against the company and petitioner to the green tribunal. The Indian Union Muslim League won the other ward. Although the Congress-ruled panchayat did not renew the licence, it never issued a stop memo to the firm over the last five years. Sabu Jacob, the current MD. 1968: The Anna-Kitex Group of Companies, with a current turnover of Rs 1,500 crore, began in 1968 as Anna Aluminium Company at Ernakulam’s Kizhakkambalam village. Founder M C Jacob started it with eight workers. It flourished amid a shortage of supply from Tamil Nadu, where firms had to cut production due to a power crisis. 1970s: Early that decade, Jacob ventured into textiles when the state government requested him to set up a unit to shelter around 400 of the 3,900 power looms that the central government had allotted to Kerala as part of an employment scheme. Jacob formed 10 units with 400 looms each, heralding the beginning of Kitex, which started with lungis. 1995: The company started a cent percent export-oriented garment processing unit focusing on children’s apparel. By then, the group had diversified into spices, school bags and umbrellas. Today, it is Kerala’s largest private sector employer with a strength of 15,500. 1997: The CPM’s union CITU launched an agitation against the company. They agitated for 450 days but withdrew for want of employees’ support. CITU sources said company founder Jacob had close links with leaders of all mainstream political parties. He had been an ayurvedic practitioner who treated several leaders. No political party has formed a trade union at Kitex or the group’s other ventures. 2015: M C Jacob’s son Sabu Jacob, the current managing director, says there is no need for a trade union in his firm. “We have only permanent employees from the day they join. We ensure they get all facilities which no other group offers to such a huge number of unskilled workers. We have invested Rs 8 crore in our kitchen where food is free. 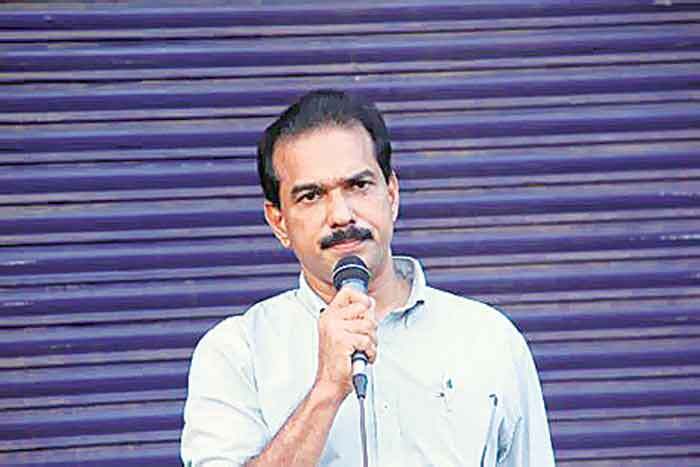 Hence, there is no ground for trade union activity to take up workers’ issues,” Sabu Jacob said. Pollution charges against the processing unit of Kitex Garments, functioning since 1995, were first raised in 2012. A local action council filed a petition with the State Pollution Control Board which, however, reported to the Kerala High Court that samples collected from the sewage treatment plant were found conforming to pollution control norms. The council has since moved another petition in the southern bench of the National Green Tribunal in Chennai; this is pending disposal.